Fuu: Alright, that’s enough! You two made me a promise. You haven’t forgotten, have you? Until we find the “Samurai who smells of Sunflowers,” you two are not allowed to kill each other! Mugen: Oh yeah, this smelly guy, I been meaning to ask you about that. Jin: Who is this “Samurai who smells of Sunflowers”? This is an amazing piece of art from the classic anime, Samurai Champloo. 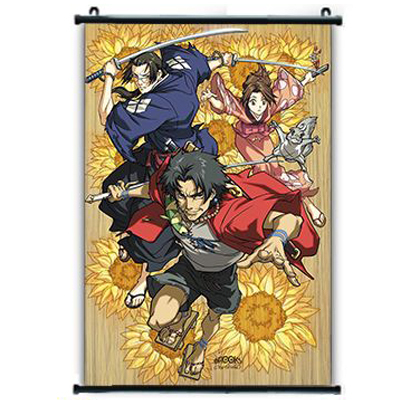 This 23″ x 35″ wall scroll features the main characters, Mugen, Fuu, and Jin surrounded by the ever evasive sunflowers–symbolic of Fuu’s long-lost father whom she refers to as the “Samurai who smells of Sunflowers” (a.k.a. “smelly guy” to Mugen). This is a must-have scroll for any Samurai Champloo fan–or anybody who just loves great anime art!